The Export PDF window allows you to set the paper size and orientation of the PDF document you are about to create. To display this window export a file in PDF format. Choose the page size from the Size drop-down list. Choose the page orientation from the Orientation drop-down list. For a custom page size select <Custom> from the Size drop-down list and set Width, Height and Units appropriately. Click OK to create the PDF document and close the window. Click Cancel to cancel the export process. 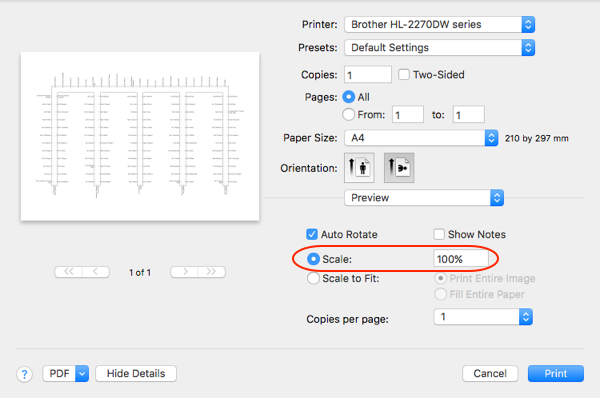 Note When printing a PDF, make sure you set the scale to 100% (no scaling) to print the PDF at the correct size.